[By Nick] Along with their standard Chocolate and Vanilla bases, Chocolate Shoppe Ice Cream also sent free samples of two very non-traditional base only flavors : Black Licorice and Blue Moon. I’m not a fan of Black Licorice at all. Thankfully Dubba reviewed* that one awhile back so I was able to give that pint away to someone I knew would truly appreciate it. 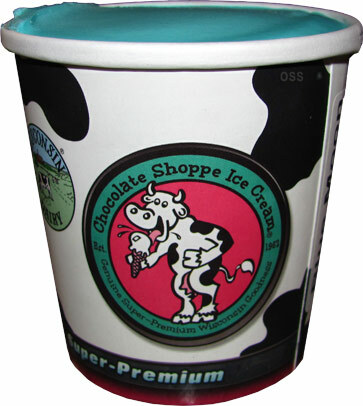 Now Chocolate Shoppe Blue Moon ice cream on the other hand, I’m very excited to try. I’ve been craving that flavor ever since my experience with the Cedar Crest Blue Moon ice cream sandwiches. Ice cream that basically tastes like one of my favorite cereals growing up is always awesome and that blue color can’t help but make the child in you smile. Hopefully Chocolate Shoppe’s version will be able to invoke such emotions again. Well that’s not as shockingly blue as I was expecting. 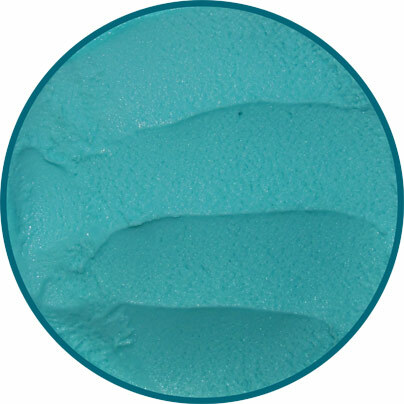 It’s actually more of a robin’s egg blue if we’re getting technical. There is a slight smell of fruit loops but nothing too noticeable. As for taste, Chocolate Shoppe hit it on the mark with their description. I couldn’t sum it up better to be honest. While Cedar Crest version had the potent taste of dry Fruity Pebbles, Chocolate Shoppe’s version is mellower with a milkier taste to it. Seriously, if it wasn’t for their excellent texture I’d be fooled into thinking I was drinking the end milk from a bowl of Fruit Loops. There’s really not much else to say about this flavor except to say that I will be sad once this pint is gone. Blue Moon is a regional flavor so I have no idea the next time I’d be able to try this flavor again. If you like Fruit Loops, this is a must try if you’re able to get your hands on it. Verdict? It tastes like Fruit Loop infused milk! Buy Again? If I did another ice cream source order I would definitely add it to my cart. I used to get Blue Moon ice cream at Ella's Deli in Madison, Wisconsin, throughout my whole childhood. It was my favorite flavor. Never tasted fruity, though. Always had a smooth, round vanilla light-pistachio cream-like flavor. Beats "superman" ice cream any day. @Anon: Blue Moon is technically the mystery flavor of the ice cream world since no one knows the true flavor and each recipe is different. I got hints of almonds in the other blue moon I tried but this one lacked any nuttiness. I still want to try superman ice cream though just for the colors aha. This was a favorite flavor of a friend of mine. He lived in Missouri and Minnesota, and found it in both places. When he first described it to me, he called it "wedding cake ice cream," which I don't really understand, even after having tried five brands of this flavor. I suppose maybe he's comparing it to a heavily-zested wedding cake he had once and found particularly memorable. Some are definitely less fruity than others. Finding it used to be a lot harder here in Minnesota, but now I've seen a couple brand name and generic varieties in grocery stores, and of course icecreamsource has all four Wisconsin-made varieties. For as many different "mystery flavors" as there are for Blue Moon ice cream, there are at least as many recipes for the Blue Moon cocktail. All have Blue Curacao (orange liqueur) and many have Heavy Cream. To me, these are the dominant flavors of Blue Moon. I've also tried it with added White Creme De Cacao, and of course, an extra shot of vodka. Here's a fun link to a short Chicago Tribune article from 2007 on the history of Blue Moon. @Josh: I actually remember reading that article when I bought those cedar crest sandwiches. The flavor does make me wish it was actually available in my area just for the fun, nostalgia aspect I get when it reminds me of some of my favorite childhood cereals. I'm straight edge so I have no idea how any of those alcoholic beverages taste but I'll take your word on it aha. Around the end of my teenage years I lost all interest in ice cream... and yet somehow I WANT THIS. Maybe it's just the color; I don't know... but the flavor sounds like something I would really enjoy. @Echo: If you have access to it, go get some! The only ice cream I've encountered that tastes like Froot Loops is Jeni's Wildberry Lavender, which is delicious but expensive. I had no idea that blue moon flavors tasted like the iconic loops; I had never researched it and always assumed that by "blue moon" they meant the alcoholic beverage brand!